In 1920, Grace Pattison and her daughter moved out of Fairlawn, the grand Victorian home built by Grace and her husband Martin, a former mayor of Superior. She gave the estate to the Superior Children’s Home and Refuge Association (SCHRA), and it became a children’s home. In the early 1960s, as public agencies such as Foster Care began taking greater responsibility for the care of orphaned and needy children in communities, the number of residents at SCHRA fell as upkeep and maintenance costs rose. In 1962 the SCHRA ceased operation, citing the diminishing need of its services and a doubtful future in the community. By then the house itself was in less-than-ideal condition, and its future was in jeopardy. A plan quickly arose to acquire the mansion as a future site for the Douglas County Historical Museum, then housed at 1827 John Avenue in the former A.A. Roth home. City officials, the SCHRA Board, and the community at large supported the idea, but there was a snag. The terms of Grace Pattison’s 1920 gift clearly stated that if the property were sold, all remaining buildings must be razed. Grace had passed away in 1934, leaving the document as her last word on Fairlawn’s future. What had been Superior’s grandest home was suddenly on the chopping block. Dissent quickly rose from numerous quarters, including an impassioned protest from the Superior Federation of Labor, delivered by its president, Paul Akers. Akers argued that destruction of Fairlawn amounted to a rejection of the craftsmanship of the Superior tradesmen who had built the mansion. Moreover, Akers added, many people felt the mansion was a unique and significant testament to Superior’s boomtown era, when it was thought Superior would soon rival Chicago in industry and population. To destroy Fairlawn was tantamount to disregarding the city’s proud history. Saving Fairlawn became a community priority. At the request of Superior Alderman James Susens, then-City Attorney Toby Marcovich began pursuing legal actions to save the mansion. After close scrutiny of the document transferring Fairlawn to the SCHRA, he discovered a loophole: If the SCHRA was to sign off on the deed, ownership of Fairlawn would revert to Grace’s heirs, who could then dispose of it in any way they saw fit. The Pattison family wholeheartedly embraced the plan for preserving Fairlawn as a museum, and on January 2, 1963, Superior purchased the estate for $12,500. In the spring of 1963, Douglas County Historical Society Curator James Lundsted oversaw the task of transforming Fairlawn into a museum to house the Society’s collection of artifacts. On June 6, Fairlawn was rededicated as the Douglas County Historical Museum. Fairlawn remained home to the DCHS for 36 years, featuring displays combining Victorian artifacts—including some original Pattison pieces that family members donated—and historical artifacts representative of Superior’s early settlement days and forward. In later years, under the direction of Rachael Martin, DCHS would host gala events including Victorian teas, murder mystery dinner theaters, and ice cream socials. The museum’s History Sundays program featured guests covering regional historical topics. During her tenure with the DCHS, Martin would plant the seed that grew into Fairlawn’s restoration. By the early 1990s, Fairlawn was showing the expected signs of wear and tear for a century-old building. Superior took advantage of a federally funded Community Block Development Grant to begin sprucing up the Queen Anne mansion. It began with an exterior makeover that included removing asbestos siding, replacing the roof, and replacing modern storm windows with period-appropriate reproductions. Elements that had been removed—including balustrades and a turret—were reconstructed. Work needed to be done inside as well. Fortunately, the first floor was in remarkably good condition despite having housed over 2,000 children as the SCHRA—mostly because the children spent very little time there (they were only allowed in the dining room for meals and the sitting room for family visits). The upper floors saw more changes through both the SCHRA years and as the DCHS museum. Much of the woodwork had been painted over. Once exterior improvements were underway, Martin turned her focus to landscaping the estate grounds. She began contacting possible sources for funding the project, and one of her many letters went out to the Jeffris Family Foundations in Janesville, WI, a foundation known for financially supporting historic restorations throughout the state. Jeffris Family Foundation president Thomas Jeffris declined the request but expressed an interest to learn more about Fairlawn. Jeffris was impressed during his visit, enough to prompt him to offer a $30,000 matching grant for Fairlawn’s restoration. The DCHS and the Tourism Development Foundation of the Superior/Douglas County Chamber of Commerce each came up with $15,000 for Jeffris to match, and suddenly the DHCS had a budget of $60,000 to underwrite the development of a master plan for restoration. In October 1996 the Jeffris Foundation offered another $600,000 challenge grant. Douglas County and the City of Superior threw in $150,000 each, and the DCHS raised the remaining $300,000. On October 1, 1996, then-Mayor Margaret Ciccone designated the restoration of Fairlawn Mansion as the city’s official sesquicentennial project. Work began in September of 1997. A collection of photographs owned by the DCHS proved invaluable to the estate’s restoration. David F. Barry, a frontier photographer headquartered in Bismarck, North Dakota, who specialized in portraits of Native Americans, was a friend of Martin Pattison. Barry lived in Superior from 1890 until his death in 1934. While Pattison was still alive—and the house was in its glory—Barry took many photos of Fairlawn’s interior. Those photos helped architects and designers with the restoration, as they essentially served as records of the house’s original murals, textile patterns, and furnishings. With the restoration complete, the City of Superior felt that Fairlawn was more suitably interpreted as a historic house museum rather than as the County’s general museum of artifacts and collections. The lease to DCHS was not renewed and the organization eventually relocated in the historic Vasa Temple at John Avenue and Eleventh Street. 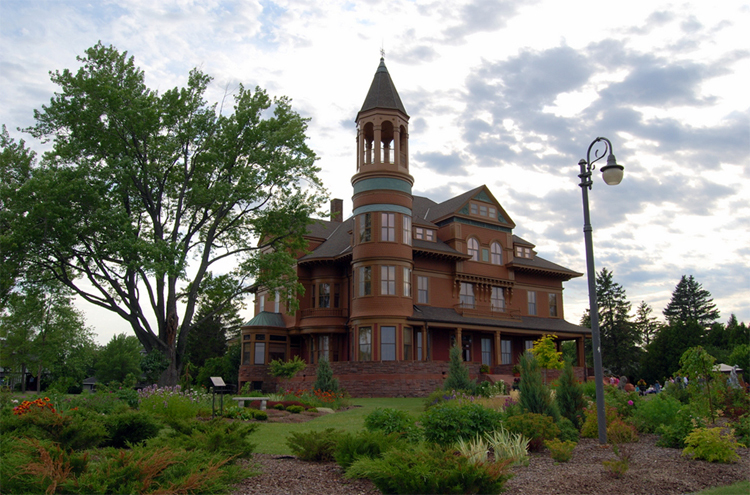 Superior Public Museums now operates the house as Fairlawn Mansion, providing tours and hosting various events throughout the year.